Looking for a way to introduce your baby, toddler or young child to music? Enjoy music classes for children 0-6 years in downtown Toronto. 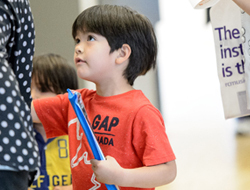 Under the umbrella of The Marilyn Thomson Early Childhood Education Centre, The Royal Conservatory is dedicated to ensuring every Canadian child receives the rich cognitive and developmental benefits of music education from the earliest possible age. 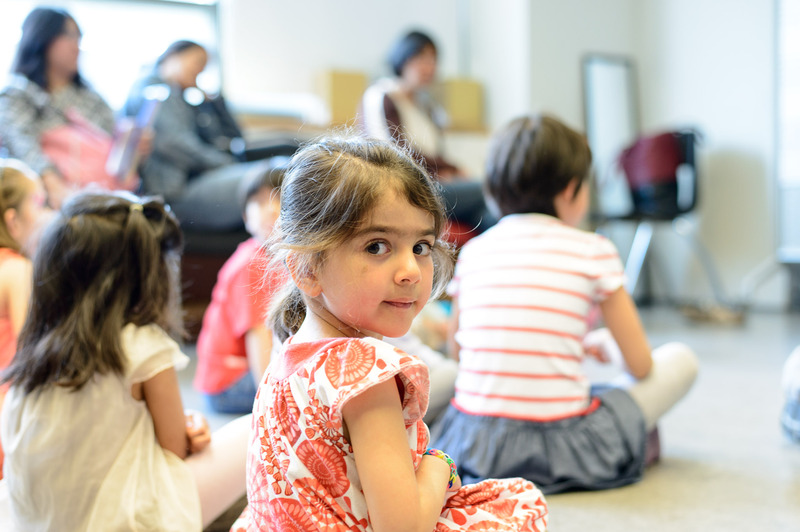 Royal Conservatory School (RCS) early childhood education begins with our unique Smart Start™ curriculum for children ages 0 - 6. Smart Start&trade delivers unparalleled early childhood music education (ECME). 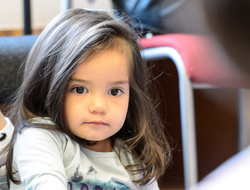 Supported by our onsite research lab, Smart Start™ combines the latest research in neuroscience with traditional early childhood learning methods. Weekly participation provides a solid musical foundation, setting the stage for cognitive development, increased confidence, and creativity in babies and toddlers. Read about the Royal Conservatory's Schools' unique approach to ECME. Enjoy rhythms and rhymes, learn some new lullabies, and have fun with your little one! 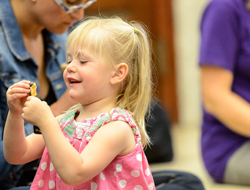 Children are naturally curious about music from a very early age, and the positive atmosphere of this class helps foster lifelong connections with music, builds strong parent-child emotional bonds, and provides a weekly forum for social interaction. The goal of this course is to expose you and your child to the basic concepts of music through sensory awareness and active participation, with particular attention paid to beat, rhythm, and listening skills. You and your child will start to learn about the fundamentals of music through movement, singing, and play. The course is designed to foster basic cognitive skills through a musical framework, and to help parents and caregivers learn ways to interact with the child through music. A typical class begins with a greeting song, followed by gentle bouncing games, finger plays, movement, and playing with instruments. The class concludes with lullabies or other songs for all to enjoy. One parent or guardian accompanies their child for the full year. Toddlers are almost always on the move! Channel your child's natural energy through music and movement learning. The active, music-based activities in this class help support your child's cognitive, social, emotional, intellectual, and physical development, while facilitating parent-child bonding. Coordination, body control, and spatial awareness skills are accrued through games built around walking, dancing, and age-appropriate percussion instruments such as shakers, drums, and bells. As infants grow into toddlers, their musical abilities and needs develop as well. This class works with toddlers' ever-expanding cognitive skills through rich and engaging musical activities with the child and caregiver. Activities focus on topics such as musical memory, creative artistic play, and active imitation. Parents and caregivers both participate, giving you the tools to interact with your child musically. The activities in this class have been specifically designed to develop listening skills and improve memory through repetition, as well as to enhance cognitive skills. The toddler's social skills are also developed through experiencing music in a group setting. One parent or guardian accompanies their child for the full year. Confident, active kids become confident, active adults! Set your child on the right path by engaging them in music and movement based play. This class focuses on developing gross motor function in toddlers by encouraging them to move their bodies in time to sounds and music. At age 2, children are beginning to develop more complex cognitive skill that will aid them later in life. These classes focus on cognitive skills relevant to music, such as sustaining attention, remembering songs, and recognizing perceptual cues. Children in these classes will learn how to apply these skills towards musical exploration, and gain greater musical independence through basic musical skills. At this age, parents or caregivers assist their child’s musical creativity and gain further skills for musical interaction with their child. With an emphasis on the fundamentals of listening and singing, playing simple instruments like maracas and drums, and taking turns, this course helps develop music competence and fosters confidence, belonging, and security among its weekly attendees. One parent or guardian accompanies their child for the full course. Singing, dancing, playing games - children adore this active, play-based learning environment. In this class, children learn foundational musical skills such as tempo, meter, pitch, and dynamics together through educational, movement-based songs and games. By age 3, children are beginning to develop their singing voices, and this class encourages that development. At age 3, children's basic cognitive skills are in place. 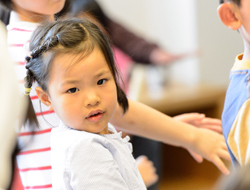 Smart Start is designed to work with these cognitive skills through activities such as recognizing musical patterns, focusing on the most important aspects of music, and understanding connections across artistic representations. Children work in musical and artistic collaborations designed to foster basic musical knowledge and spur on individual and group creativity. Socialization and personal growth are strengthened via group engagement. WINTER & SPRING REGISTRATION: Many children are ready for an independent music class without their care provider at age three, but this decision is individual and flexible. One care provider accompanies their child for the 1st session of this course. FALL REGISTRATION: Many children are ready for an independent music class without their care provider at age three, but this decision is individual and flexible. Usually one care provider accompanies their child for the 1st seven sessions of this course. The benefits children gain from music study enrich every aspect of their lives. The teaching techniques employed in this course are designed to improve and support children's socialization, fine motor skills, self-confidence, and attention span through instruction in fundamental musical concepts such as pitch, meter, rhythm, dynamics, and tempo. Listening skills are developed through exposure to a wide array of musical elements through singing games, basic instruments, and guided listening. Singing, dancing, listening, instruments and reading notation all factor into the Smart Start curriculum. Around the five-year mark, children make huge developmental leaps and begin to actively create with what they've learned. The study of musical concepts through singing, movement and instruments is a key component of this class. Teachers lead the class through pedagogy designed to improve children's senses of rhythm, meter, melody, pitch, timbre and the beginning of harmony. Basic melodic phrasing and rhythmic notation are introduced, leading to a solid rudimentary understanding of musical form. Bon Départ: Smart Start Music Classes for Children - en français! 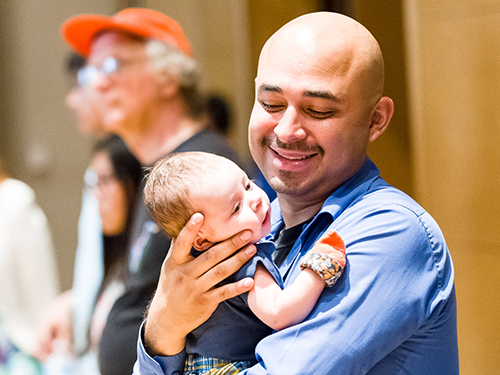 Bon Départ is the French-language version of The Royal Conservatory's acclaimed SmartStart™ program for babies and toddlers. Drawing on neuroscientific research about the benefits of music education, Bon Départ uses musical games, movement, and singing to address a child's development needs while exploring basic musical concepts such as tempo, rhythm, dynamics, phrasing, form, notation, and melody. Segmented by age, the classes become progressively more challenging as a child's skills increase. Les nombreux avantages que ce programme offre aux enfants viennent enrichir tous les aspects de leurs vies. Les techniques utilisées soutiennent et améliorent la socialisation, la motricité fine, la confiance en soi, et la capacité d’attention par l’apprentissage de concepts musicaux tels la hauteur des sons, le rythme, l’intensité et le tempo. L’écoute est développée par l’expérience d’une grande variété d’éléments musicaux, avec des jeux et activités utilisant la voix, des instruments de base, et l’écoute guidée. Chant, danse, écoute, et instruments sont les éléments clés du programme Bon Départ. Avec le programme Bon Départ, les enfants ont l’opportunité de développer leurs connaissances musicales avec un répertoire de langue française. L’enseignante guide les enfants en français et en anglais au besoin, et adapte les activités selon le niveau d’expérience du groupe. Les chansons, comptines et jeux sont en français. Le programme Bon Départ est une introduction idéale à la langue française, un excellent complément aux programmes scolaires d’immersion française, et un programme d’enrichissement pour les enfants francophones. Les enfants participent à chaque cours avec la présence d’un seul parent ou tuteur. The benefits children gain from music study enrich every aspect of their lives. The teaching techniques employed in this course are designed to improve and support children's socialization, fine motor skills, self-confidence, and attention span through instruction in fundamental musical concepts such as pitch, meter, rhythm, dynamics and tempo. Listening skills are developed through exposure to a wide range of musical elements through singing games, basic instruments, and guided listening. Singing, dancing, listening, and instruments all factor into the Smart Start curriculum. In this language-enriched class, children have the opportunity to learn their Smart Start music curriculum through French repertoire. The teacher guides the children using a combination of English and French, adjusting to the experience level of the group. The songs, rhymes and games are in the French language. This program is an ideal introduction to French for non-speakers, an excellent complement for French immersion students, and an authentic enrichment experience for those who already speak the language. Children attend these classes with a single care provider. Smart Start™ delivers unparalleled music education for young children. Weekly participation provides a solid music foundation, setting the stage for social development. Parents and children play, sing and move together in an active program exposing them to a variety of musical experiences that are chosen to promote key areas of social development. Children should be group ready, i.e. children should have some experience in a group setting and some level of comfort with peers in a social setting. Two instructors are in the room. Classes are available for different age groups, with and without a care provider. Questions regarding class selection and suitability? Please contact Colleen Didur at 416-364-9413 or at [email protected]. Thanks to the generosity of The Flanagan Foundation, bursary assistance is available for families who wish to enroll their children in a Royal Conservatory School Smart Start™ class, but who face obstacles in meeting the tuition requirements for RCS programming. Find a course for your child.